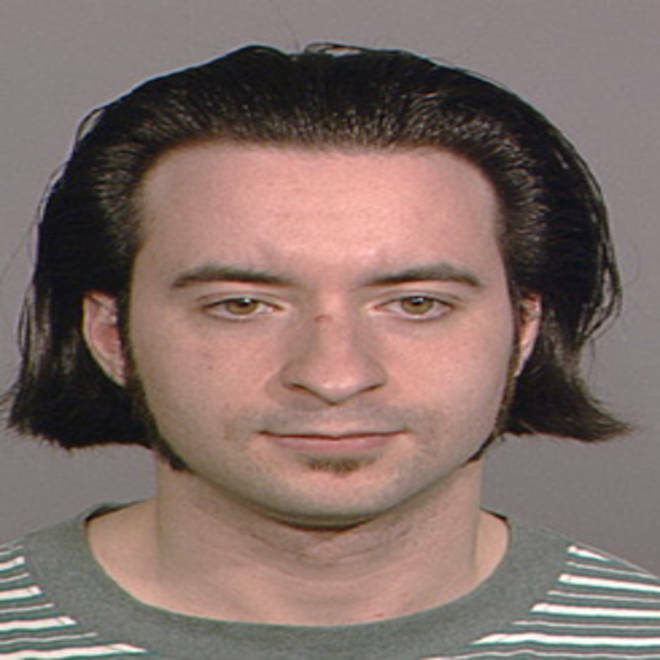 Booking photo of Andrew Engeldinger in 1997. Updated at 4:45 p.m. ET: The man who shot and killed four others then himself at a sign-making business in Minneapolis on Thursday has been identified as Andrew J. Engeldinger, 36, an employee who had lost his job earlier in the day, the StarTribune reported Friday. "It was a case he was terminated that day, he did come back about 4:25 to that location, parked his car and walked in the loading dock area and immediately started shooting people at that location," Minneapolis Police Chief Tim Dolan said Friday afternoon. Dolan said Engeldinger was found dead in the basement of Accent Signage Systems with a 9 mm semi-automatic handgun and a single bullet casing, KARE television reported. Asked if Engeldinger chose his victims, the chief said: "It's clear he did walk by some people, he did walk by people to get to certain other members of the business." Dolan said Engeldinger's weapon was a Glock 9 mm, a semi-automatic handgun. He said police found packaging for 10,000 rounds of ammunition during a search of Engeldinger's home. Barry Lawrence, a former employee who told the Tribune that he had trained Engeldinger as an engraver in 1998 or 1999, described him as "real intelligent, caught on fast." "He seemed conscientious," said Lawrence. "He was conscious about saving money. He was always worried about his 401(k) plan. When the stock market went down, he was concerned about losing money. I said, 'Just forget about it, Andy, don't even look at if it upsets you.'" Engeldinger's parents on Friday released a statement saying that Andrew struggled with mental illness for years and had lost contact with the family, KARE reported. "This is not an excuse for his actions, but sadly, may be a partial explanation," said the statement read by Carolyn and Chuck Engeldinger. They also expressed condolences to the families of those killed and wounded. Updated at 8:02 a.m. ET: A gunman killed four people inside a Minneapolis sign-making business before turning the weapon on himself, authorities said early Friday. The victims' bodies were found shortly after officers arrived at Accent Signage Systems Inc., located in a residential area in the city's north side, after receiving a 911 call Thursday afternoon, according to police spokesman Sgt. Stephen McCarty. "When officers arrived and entered the business to assist with the evacuation of employees, give aid to the victims and to search for the suspect, they found four victims dead from apparent gunshot wounds," McCarty said in a statement. Four other people were wounded, including three critically. McCarty declined to identify those killed or wounded, and said he did not know what connection the shooter may have had with the business, if any. Minneapolis Police Deputy Chief Kris Arneson said officers never fired at the shooter. She didn't release other details — including the shooter's possible motive. Neighbor Heather Buckingham, who told NBC station KARE 11 that she formerly worked for Accent Signage Systems as a receptionist, said the gunman was an employee of the firm who had been laid off on Thursday. 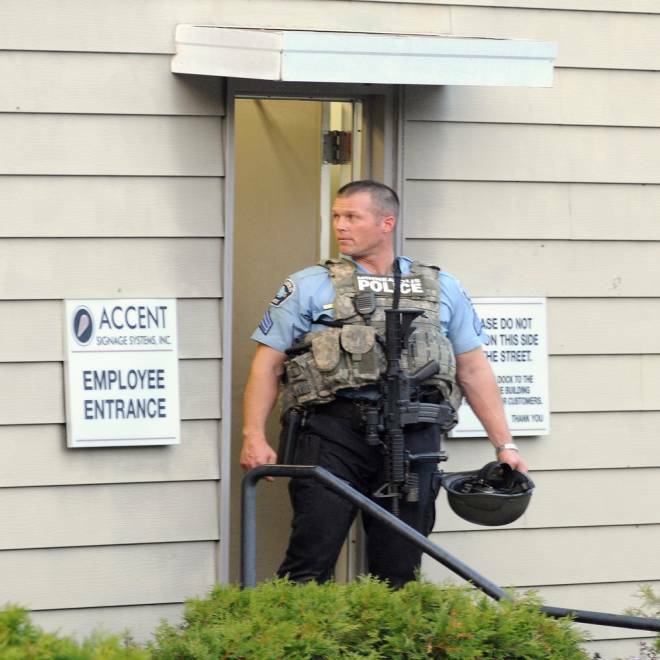 As police search for a motive in a deadly Minnesota workplace shooting, witnesses say the gunman may have been fired from his job at a small signage company earlier in the day. Four people and the gunman were killed, and four others were injured. NBC's Kevin Tibbles reports. Police continue to investigate a shooting in Minneapolis that left "several" dead and four injured. KARE's Jay Olstad reports. "The one that was doing the shooting was quiet, kept to himself," she told KARE 11. "Kind of odd." A police officer stands at the entrance of Accent Signage Systems in Minneapolis on Thursday. Local resident Barb Gasterland told KARE 11 that an employee of Accent Signage Systems came to her home looking for help. "He was visibly fearful," she said. "He came running up the side of the road and asked for the phone because he was running from the shooter." Gasterland said the man described the details of the shooting while hiding in her house for about 30 minutes. "He had watched his boss get shot and his best friend and two other people," she told KARE 11. "He could tell one person was dead at least." Minneapolis Mayor R. T. Rybak described the incident as a "horrible tragedy." 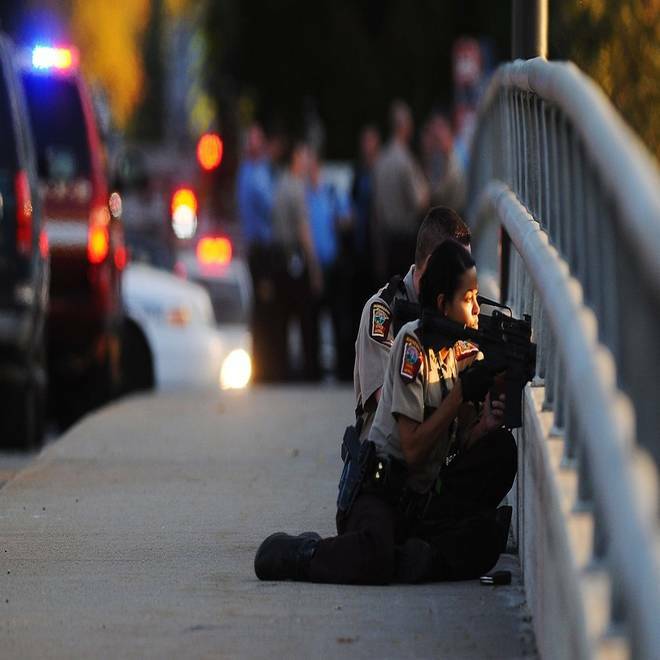 Officers with the Minnesota State Patrol man the Penn Avenue bridge over Bassett's Creek near the scene of a shooting in Minneapolis on Thursday. In a statement, Governor Mark Dayton said: "I deplore this senseless violence. There is no place for it anywhere in Minnesota. I extend my deepest condolences to the families and friends of the innocent people killed or wounded." Local business publication Finance & Commerce reported that U.S. Under Secretary of Commerce Francisco Sanchez visited Accent Signage Systems in August in a trip focused on exporting, and praised the company for its innovation. Accent Signage Systems Incorporated specializes in interior signs that help the visually impaired. The company holds a patent for technology that imprints Braille on things like hotel room numbers and restroom signs. Companies in 38 countries use Accent's technology. According to the company's Facebook page, Accent started as a part-time engraving business out of company president Reuven Rahamim's basement in 1984. It has grown significantly. Accent now employs about 30 people and earns $5 to $10 million each year.